PABLO — The American Library Association’s Choice Magazine has selected a Salish Kootenai College Press book as one of the outstanding academic books of 2016. 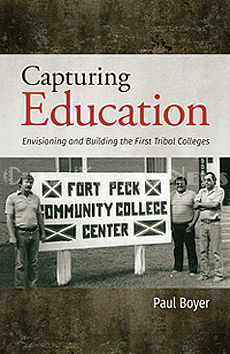 The honored book is Paul Boyer’s history of the early years of the tribal college movement, Capturing Education: Envisioning and Building the First Tribal Colleges. Boyer based his history on interviews with the founding leaders of the tribal college movement, including Joe McDonald. McDonald related the early challenges and successes in the struggle to establish Salish Kootenai College on the Flathead Reservation. The book is available for $22.95 hardback or $12.95 paperback at the Salish Kootenai College Bookstore or order prepaid by mail and include $2 postage for the first book and $.50 for each additional book from Salish Kootenai College Press, PO Box 70, Pablo, MT 59855. Read this and other fine stories from the Flathead Reservation’s own, Char-Koosta News right here.